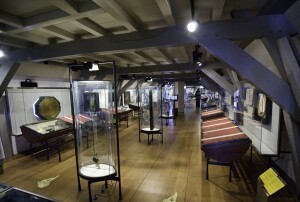 The Museum Boerhaave is has funding problems and is in danger of being closed in January 2013. For further information and how to donate, see Save Museum Boerhaave campaign. 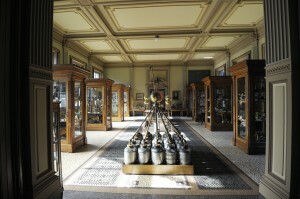 17th century science in Boerhaave museum Leiden by koopmanrob. Image licensed under Creative Commons Attribution-NoDerivs 2.0 Generic license. Boerhaave Museum. This museum, named after the former professor and physician, has been in existence for many years, but it has recently been completely restructured and installed in brand new quarters on the site of the former Boerhaave hospital. At an artistic level it has been beautifully done-the renovation retains the original architecture and the exhibit layout is spacious and encourages unhurried perusal. The emphasis is historical rather than didactive. with contents arranged in chronological sequence and not by subject area. We are made acutely aware that the division of science into specialized fields is a recent phenomenon and that in Leiden’s heyday the distinction between physics, chemistry, and even medicine was blurred. The museum has a commendable international flavor, less chauvinistic than might be expected, though achievements of Netherlands scientists are of course properly stressed. The Dutch have long been instrument makers for much of the world and a predominance of instruments in the exhibits reflects that-the collections of surgical tools, telescopes, and microscopes are especially noteworthy. Even seasoned specialists will be fascinated by the technical advances that the chronological style of the museum naturally unfolds.